A woman who identified herself as Valerie walks along flooded President Street after leaving her homeless camp after Hurricane Matthew caused flooding, Saturday, Oct. 8, 2016, in Savannah. CHARLESTON, Oct 9: A weakening Hurricane Matthew lashed Georgia and the Carolinas on Saturday in what appeared to be the last leg of its march up the East Coast, leaving in its wake millions of Americans relieved that one of the most fearsome storms on record in the U.S. wasn't that bad after all. By Saturday night, North Carolina felt the brunt of Matthew, with more than a foot of rain falling in the southeastern part of the state, causing life-threatening flash flooding, forecasters said. Homes, businesses and roads as far west as Raleigh were also damaged by the deluge. On Saturday, Matthew sideswiped two of the South's oldest and most historic cities — Savannah, Georgia, and Charleston, South Carolina — and also brought torrential rain and stiff wind to places like Myrtle Beach, South Carolina, and Wilmington, North Carolina. 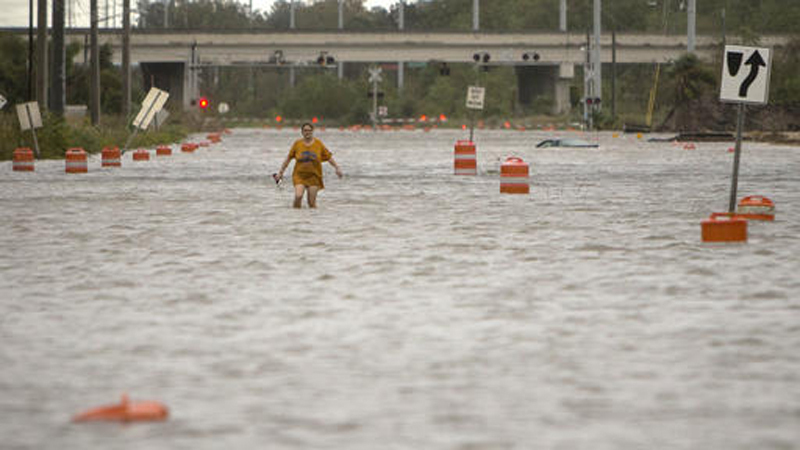 An estimated 2 million people in the Southeast were ordered to evacuate their homes as Matthewclosed in. By hugging the coast, the storm pretty much behaved as forecasters predicted. A shift of just 20 or 30 miles could have meant widespread devastation.